We respectfully submit to the PEP our petition to reconsider the closing of PS/MS 42Q in Arverne, Queens. WE MUST NOT BE CLOSED! PS/MS 42Q has served the community for over 100 years and has seen Dr. Jonas Salk himself graduate. Now we are called a “renewal” school. But we fought hard and were proud of the very measurable progress we have shown over each of the last few years. Yet despite our efforts and successes, the Department of Education has announced that they are closing our school. The Arverne community and teachers are not about to stand idly by as our school is repurposed as a centerpiece for gentrification. A closer look at some of the many factors that appear to be driving this decision indicate there may be reasons beyond what the city has cited. We must not allow fake news to force the closing of PS/MS 42. PS/MS 42 is also a Title 1 School, and as such must have extra scrutiny by the Department on progress and parent/community involvement. This never happened. .Of ALL NYC K-8 renewal schools PS/MS 42 has shown the LARGEST percentage of growth between the NYS ELA and Math exams from 2014/2015 to 2016/2017, at 16%. This must mean growth and improvement lie outside the deciding criteria. ·Of all the K-8 Renewal Schools only PS/MS 42 received a Student Achievement rating of 'Good'. All other K-8 Renewal schools received a rating of 'Fair.' So clearly student achievement was not a deciding factor, either. ·One K-8 Renewal School started with 9% of students proficient on NYS Math exams in 2014-2015. During the school year 2015-2016 they were able to make 1% increase. However, in 2016-2017 they DECREASED by 1%. Showing NO net growth from 2014-2015 to 2016-2017 yet they are slated to remain open. Why? ·At P.S.165 in Brownsville, Brooklyn, just 9% of students are proficient in mathematics, and enrollment has dropped 51 percent, but the school will remain open. While PS/MS 42Q has shown growth in ELA and Math and enrollment has not dropped but still will be closed. So declining enrollment must not be part of the deciding process. ·PS/MS42 has a very strong Parent Advocate in Queen Maakeda who was instrumental in securing a 6 Story $50,000,000 State of the Art Middle School in addition to the existing building, in September 2011. ·In recent years Arverne by the Sea, a housing development begun under the Bloomberg Administration, in an attempt to spur gentrification, built a number of new homes in the area, each worth over half a million dollars. They made their own community, shops, YMCA and a super Stop & Shop. The only thing missing as part of the stand-alone community, is a school. (...they were promised an 800 seat elementary and a 300 seat middle school….. EXACTLY the number of seats that PS/MS 42 has now, no other school in the Rockaways has this). The new school will have the exact same number of seats as PS/MS 42, so why close PS/MS 42? ·12/18/2017, 5 Days before the Holiday Break, Mayor DeBlasio and Chancellor Carmen Farina announced they will be closing the school to make 2 stand-alone screened schools (under the criteria for entrance to these types of schools the surrounding community children will struggle to gain admittance). These “new” schools will then stand ready to serve the more affluent Arverne by the Sea. ·Note the announcement was made AFTER the mayoral election and the Chancellor’s resignation followed soon after. ·In September 2005 MS180 in Rockaway was closed and became the Scholars Academy. After the school was closed all local kids were placed in other schools NONE of the children who originally attended MS180 were admitted into Scholars. PLEASE DO NOT CLOSE PS/MS 42. WORK WITH US TO MAKE THE SCHOOL WORK FOR ALL THE STUDENTS, PARENTS, AND STAFF WHO ARE IN THE SCHOOL AND WHO WANT TO STAY IN THIS SCHOOL. We greatly appreciate your attention and urge you to reconsider this matter. The "Renewal" Program for failing schools in NYC was a huge scandal for the de Blasio administration, and an embarrassment for Carmen Farina. We all know that the New York City Department of Education is a political institution controlled by the Mayor, all of his partners, and subject to his whims and fancies. Racial segregation and misconduct (see here, here, and here, for a few more examples) are rampant throughout the NYC DOE. And, there is nepotism, workplace harassment, disability discrimination, bullying, civil rights violations and denial of due process all over the place. In my opinion, when Carmen Farina was removed from PS 6 in February 2001 (that is a fact), and she went to District 15 to wield her authority and create havoc there, she and Bill de Blasio started cooking up the reign of error she has shown as Chancellor since Bill took office in January 2014. Many friends and I begged Bill not to appoint her Chancellor. Obviously, he wasn't listening. Carmen is a master at subterfuge and deliberate miscommunication. But the opposition to Carmen Farina and her outrageous policies are not unified, even though New Yorkers are familiar with her games, at least I am. But she is the person who oversees the scams and sham policies and offices, including the ridiculous and dangerous puppets on the NYC "school board", the Panel For Educational Policy. Why are the members of the PEP dangerous? Because they vote on financial matters without any understanding of the consequences on the parents, students, staff, and/or community whose lives and welfare depend upon the funds voted on, and they act without any accountability to the community they supposedly serve. A very clear answer to "why doesn't the Department do something?" is: Carmen doesn't care who is speaking into the microphone for 2 minutes, she is not listening. All votes are a done deal before the PEP begins. Pouring your heart out does no good, if your goal is to have any PEP member up there on the stage listen to you or care what you think. In 2008, my dear late teacher friend Polo Colon and I attended the PEP meeting at Tweed, (see us at a 2007 meeting)and stayed until the meeting room was almost completely empty. Polo saw something on a chair for a PEP member, and said to me, "I'll be right back". Polo went behind the table where the PEP members sat, picked up a couple of papers left on the chair, and brought it back to me. These papers were the script that had prepared answers to whatever questions were asked at the meeting. There was a warning, that no mere "opinions" were to be given by any member on the PEP. All the answers given in the script inferred that the person asking did not know what they were asking, and told the PEP member to not answer. I was at the January 24th meeting (see me sitting on the left, next to the speaker) where people spoke about how there was no plan, no discussion, no parental involvement; we heard heartache and trauma about the closing/merging/truncating of schools. No one on the PEP cared. No one. The way Carmen does things is to make a change, then give Notice, and tell people they can speak for two minutes before the PEP members vote. There is something very wrong about this process. In fact, it is backward. First should come the discussion. Second, the strategy to accommodate the community and the parents and kids. Third, to integrate the programs and strategies that will accommodate all parties. Then, as a last resort, if nothing else works, a vote to close/merge or join together the schools under review. Right? It is completely wrong for Carmen Farina, Bill de Blasio, and all their nameless partners, to close PS/MS 42 in Averne Queens. Now, we need a lawyer to file an Injunction and Order To Show Cause to stop the vote on the closure of PS/MS 42 on February 28, 2018. Are you a lawyer? Contact me at betsy.combier@gmail.com. Please help the staff, students, parents and community of PS/MS 42 stay open!!!!!!! We are a renewal school, serving our community and working hard to improve. In fact, our school is making steady progress in test scores and quality reviews, by the New York City Department of Education’s own measures. * Of all New York City K–8 renewal schools, PS/MS 42Q has shown the largest percentage point growth from 2014-15 and 2016-17 in math and ELA combined, with 10.5 points in ELA and 6.5 points in math, for a combined 17 point increase. 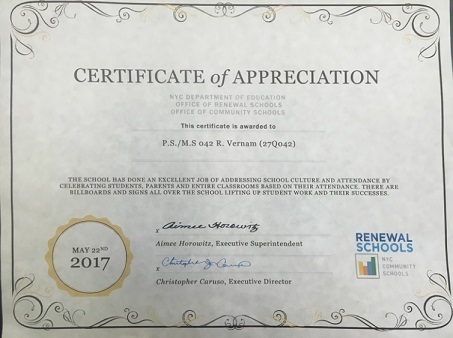 * PS/MS 42Q had the highest percentage rating for rigorous instruction at 86% for all New York City K–8 renewal schools. * PS/MS 42Q has the highest percentage of teacher attendance, at 97.3%, of all K–8 renewal schools. * PS/MS 42Q has met five out of seven target goals, including effective school leadership, trust, collaborative teachers and student achievement. We also have a high level of community engagement, which sets us apart from many other renewal schools. Our school is a lifeline for the surrounding neighborhood, with community dinners for families, a service-learning model in which students read to seniors at a local nursing home and overall high community involvement. Ninety-six percent of parents say that teachers at this school work closely with families to meet students’ needs. Students say that they are learning a lot in classes at their school to prepare them for the next grade (96%). Students also say that most students try hard to get good grades (85%) and students behave well even when the teacher isn’t watching (56%). That’s why parents, teachers, administrators and local politicians are working together to save our school. We’ve been working hard and are pleased to see our quality review metrics, school climate and student academic achievement all show improvement. Our school welcomes all students and serves a population that has greater challenges than at least 90% of the schools in New York City. We are proud of our mission and proud of our achievements. Please don’t stop our progress! We hope to continue working for all the students and families we serve. Look again at our school — we urge you to reconsider this closure. Twenty K-8 schools had lower passing rates in ELA than PS/MS 42Q. In addition, while PS/MS 42Q met its ELA achievement target, 19 of these 20 did not. Only one of these schools is slated for closure. Source: New York City Department of Education, School Quality Report, 2017. But when Mayor Bill de Blasio took office, he had a different idea: Rather than shut its doors, he would revamp it. After three years in deBlasio’s “Renewal” improvement program, which injects troubled schools with academic supports and social services, P.S./M.S. 42 appeared to be making progress: Its test scores and quality reviews have steadily improved. Enrollment, while lower this year, has mostly been stable.